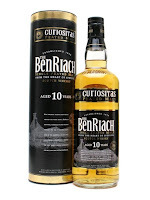 Another review from me, this time it's a BenRiach. It's a Speyside malt but some of it they peat, some not. Not that unusual these days, as everyone seems to be jumping on the peat train but BenRiach were doing it before it was cool. Nose: Peaty and sweet, throat lozenges, antiseptic, citrus fruit- Lemon, green apple and lime, candy, barley sugar, malt, smoked meat? Floral notes coming out after a bit- Lavender and heather. Water: More creamy, vanilla, fudge, butterscotch. Then a lovely floral note- Cherry blossom. Peat very much taking a backseat. Taste: Light arrival, sweet peat developing with oak spice and barley sugar, toast, peat fire, lime juice, lemon sherbet, lemonade, very fizzy into the finish. Water: More creamy arrival with vanilla and vanilla fudge then a juicy development with more fruit- Lemon, lime and some orange. Peat now in the background. Finish: Medium length. Peat hit then fading barley malt. Very nice, but I've yet to try any unpeated BenRiach to compare. Full Disclosure Disclaimer: I currently work as a Brand Ambassador for Penderyn Distillery. The views expressed here are purely my own and do not reflect the views of Penderyn Distillery or The Welsh Whisky Company. I try to maintain as much objectivity as I can but feel free to take my reviews with as big a pinch of salt as you like. Furthermore, I have never accepted free samples from anyone in the whisky industry, but have bought bottles or samples with my money, bringing a different set of biases. Also, my rating scale is NOT based on a Parker type wine scoring scale or a school/college/university % or A-F grade score.